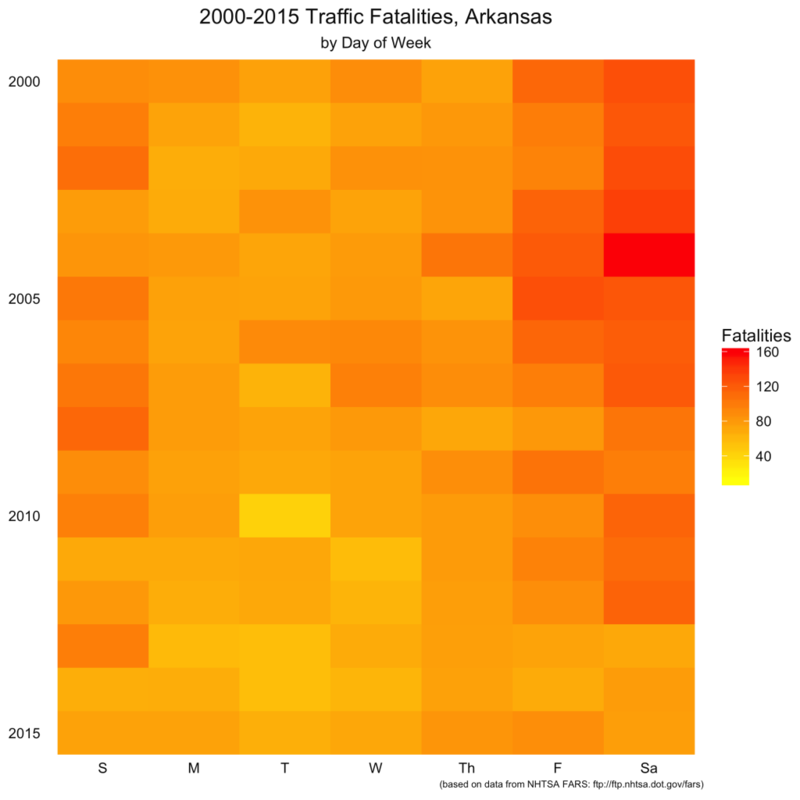 I recently started a master’s program at UALR in information science, so I’ve been following several blogs on statistical programming and visualization. 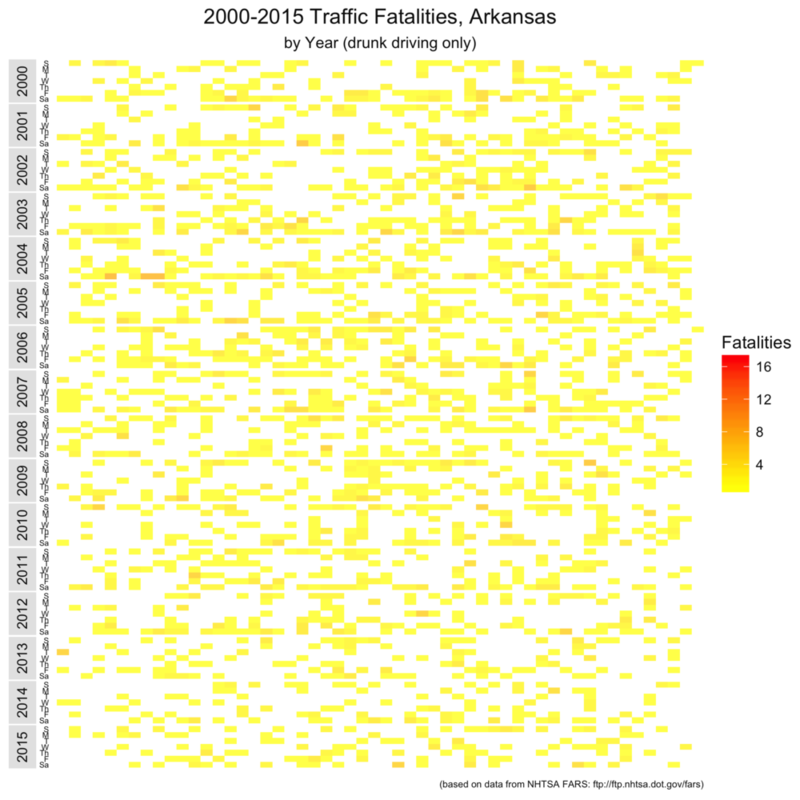 One of the best sites I’ve found is R-bloggers, which is dedicated to the popular statistical programming language R.
So, I decided to adapt Mr. Puente’s R program to create an Arkansas-centric map. In the R-bloggers tradition, I’ll explain the code and then present the results. Next, I had to get the wet/dry status of each Arkansas county. To do this, I created my own CSV (comma-separated value) file from the Arkansas Department of Finance and Administration’s wet/dry status page. I uploaded it to a Github public repository so others can use it. As Mr. Puente did, we’re only going to use a portion of the NHTSA’s information. However, instead of using the lower 48 states, we’re just going to use data for Arkansas. We’ll then sum the number of fatalities for all wrecks by county. 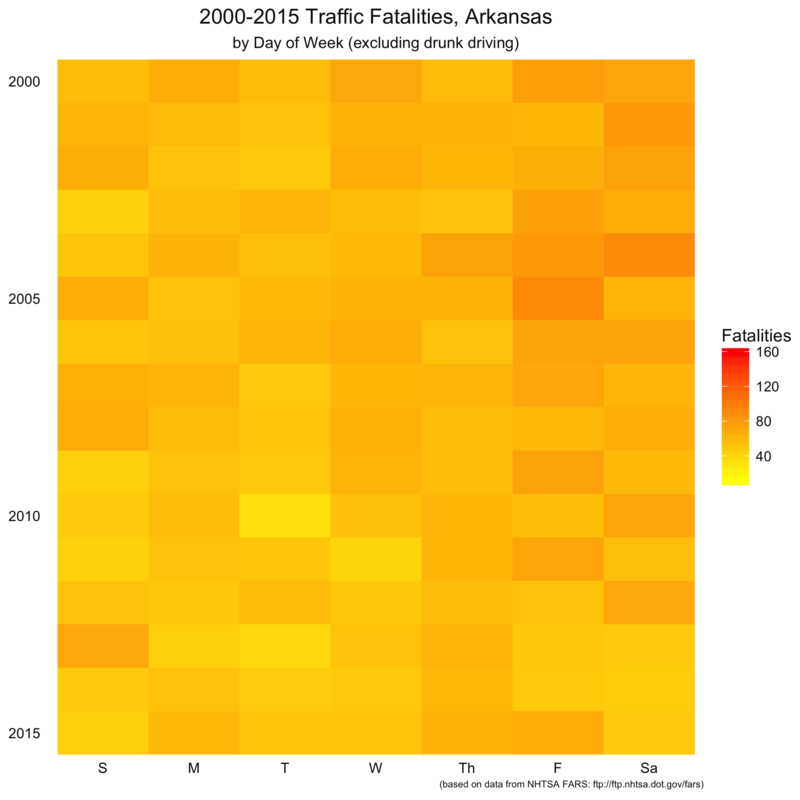 Next, we’ll create a vector from the wreck subset to identify just the drunk driving wrecks. We’ll use that vector to sum drunk driving fatalities per county, then calculate a percentage of wrecks involving drunk driving fatalities for each county. We’ll merge that data with the wet/dry status of each county. So we can color the scale differently for wet counties and dry counties, we’ll multiply the percentage by -1 for wet counties. 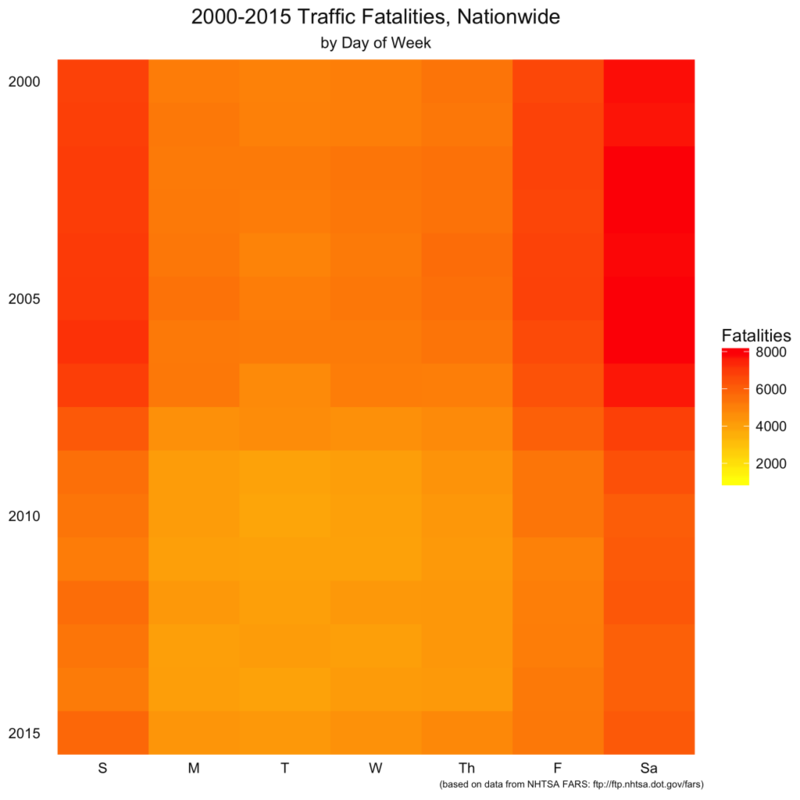 Finally, we’ll get the midpoint of the number of drunk drivers, which we’ll use to color parts of our map later. The goal with the visualization was to show the wet/dry status of counties having drunk driving fatalities. So, the percent_drunk column we created earlier, which contains percentages from -100 to 100, serves as the fill. We’ll define a continuous scale in different colors to differentiate between wrecks occurring in wet counties and dry counties; by choosing white as the midpoint, we’ll be able to see which counties had no drunk driving wrecks in 2015, and it will also give us a gradient that shows some idea of how many wrecks occurred. The next goal was to represent the number of fatalities in each wreck by the size of the point. 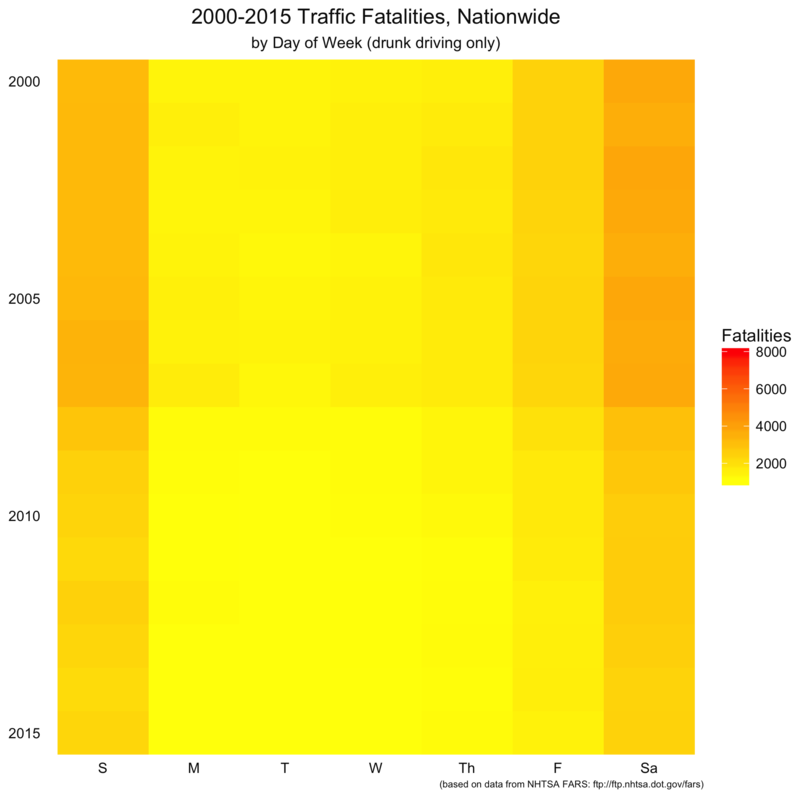 The NHTSA dataset also contains an interesting data point for the number of drunk drivers involved, which we’ll use for the color of the point. It appears that one wreck in Pulaski County involved 3 drunk drivers and killed several people. Finally, we’ll use Mr. Puente’s other adjustments for cleaning up the map, and then plot it. 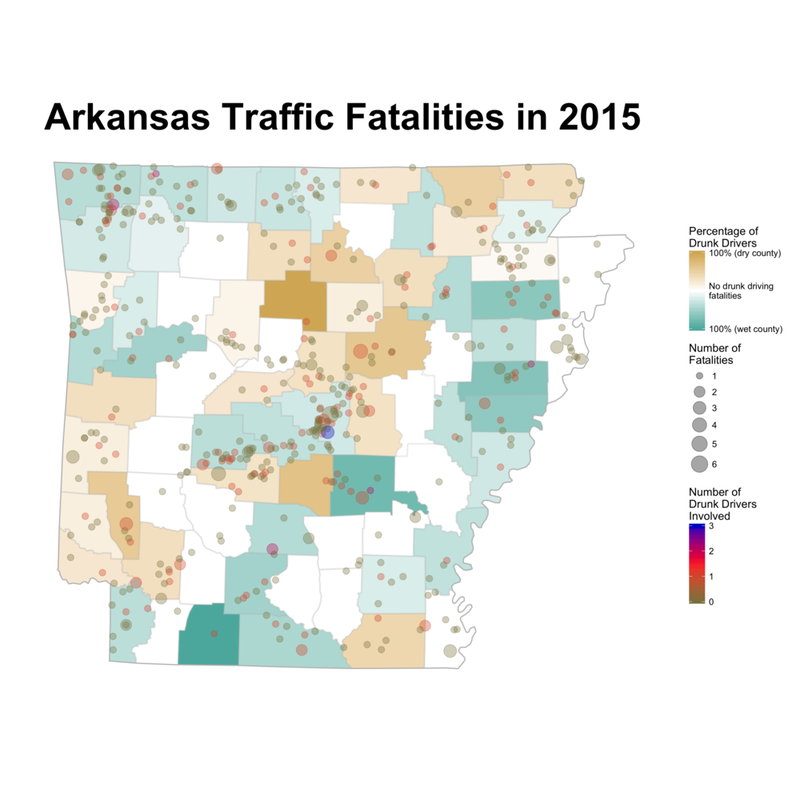 The result is a detailed graphic that shows in a glance that 21 of 75 counties had no drunk driving fatalities in 2015. If you know anything about Arkansas highways, you can definitely see the outlines of US-70, I-30, I-40 west of Little Rock, and I-49 from Ft. Smith to Fayetteville.